1952 - An English boy travels by train reading Western comic books and imagining gunfights and bar brawls with cowboys and Native Americans and a stagecoach in the American West. Standing Rock Protesters gather in front of the United States Courthouse in solidarity with Native Americans blocking construction of the Dakota Access Pipeline. Native Americans cook and make tortillas in Guatemala in the 1930s. 1950s: Man on horseback yells and gestures. Covered wagons form a circle. Men and woman hold rifles. Native Americans approach. Native Americans pound drums in Hollywood marching and chanting against the Dakota access pipeline. 1940s: Native Americans dance, drum and perform in traditional clothing. Two Native American men perform an Eagle Dance. 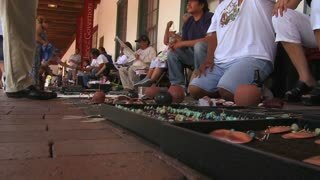 Native Americans sell their crafts and wares to tourists on the streets of Santa Fe, New Mexico. Close up and slow motion video of fair-haired model in Indian war bonnet,. Beautiful girl in feather headdress of Native Americans, walking in tropical forest. 1920s: CANADA: man stands by lake. Man walks across footbridge. Man waves at camera. Native Americans by lake. Flag on pole. Bird flies above lake. 1930s: Native American family sits in front of tent. Native Americans perform and dance in a ritual. 1930s: Paintings of Native Americans in ceremonial costumes. 1930s: Village. Native Americans perform ceremonial dance. 1930s: Village. Native Americans perform ceremonial dance. Men drum. Seminole Native Americans use air boats and headlamps to move around the swamps of the Everglades and hunt in a 1949 documentary. 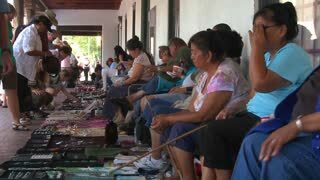 Sowing machines are used by Seminole Native Americans as portrayed in a 1949 documentary. The Everglades, home to the Seminole Native Americans, is being encroached by farmlands and development according a 1949 film about Seminoles, that includes racist suggestions of the superiority of white men. The United States office of Indian affairs was a government agency that provided services to Native Americans, among them the Seminoles of the Everglades in Florida. The US government creates incentives and assistance schemes to assist Seminole Native Americans to launch into the cattle business according to a 1949 documentary. A 1949 documentary about Seminoles shows the way of life of the Native Americans in villages that are built on patches of high ground in the Everglades. Native Americans attack new arrivals of American pioneers in the frontier (as depicted in 1948). In this 1948 re-enactment, Native Americans encounter French priests and a fur tradesman traveling through 17th century Michigan. Early Native Americans get work done by hand, then are seen using animals to do work for them, portrayed in 1956. Native Americans trade goods at a market in Guatemala in the 1930s. Native Americans dance at a festival in Guatemala in the 1930s. Native Americans carry goods and babies in packs in Guatemala in the 1930s. Native Americans convene in their village in Guatemala in the 1930s. 1933 - Native Americans harvest many kinds of food. 1952 - Boats pass along the Wisconsin River, and Native Americans are seen along the banks. 1952� Visitors swim in the San Juan Islands, a ferry goes to Port Townsend, visitors hike to the ranger�s station on Hurricane Ridge and take in the view, and, Native Americans take visitors on tours in canoes. 1950? Native Americans farm with primitive tools bear their village. 1929 - WWI veterans, Texas cowboys, and Native Americans are highlighted in President Hoover's inaugural parade.